We had the pleasure of seeing our friend/artist, Hillary Butler this morning. She’s awesome and so creative. I work with her husband who is our art teacher and the creativity must just ooze out of their house. I told JD I wished I was creative like that and he was so encouraging to remind me that I am creative all the time – with smocking, sewing, stationery…just not painting. Thank you for the affirmation, JD. I love you. Hillary is partnering with the Memphis Botanic Garden for an event this spring in the Big Backyard. 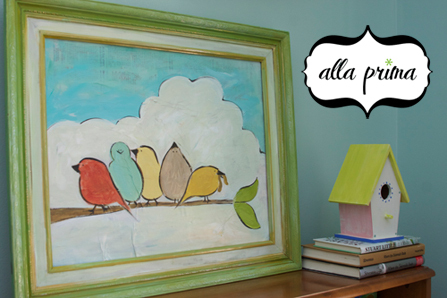 It will be an Alla Prima party for kids. She used Garner’s room for her “set” and below you see the fun painting the kids will get to do. I’ll post more info once the details are in order. One of the cool things about this is that it’s earth-friendly and painted on recycled newsprint! You’re doing your part Hill! Isn’t that so sweet?! I love seeing it in different frames – really changes the feel of the piece. 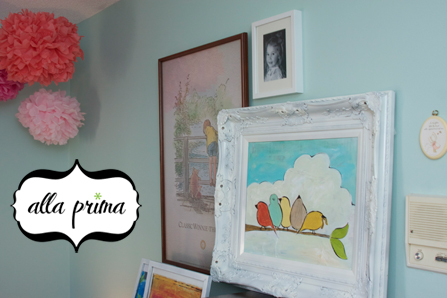 Visit her at www.paintallaprima.com to see some of her “grown-up” paintings and even me! My friend Donna and I did a party with Hill in December. We painted Tres Trees and it now sits in my wonderful office. I love the color palette she uses. Right up my alley. She’s given and hint of peonies for the spring. I’ll be the first to sign up! – 3 closets have been cleaned out. 6 to go. Having a lot of storage space means having more space for junk to collect. – I’ll be going through all of Garner’s clothes and baby things over the next 2 weeks for donating, selling and giving. Our church consignment sale is the end of March and I plan to sell quite a bit. – We have money earmarked to pay off on credit card by the end of Feb, repair the fence, and purchase new landscaping for the front of the house. YAY! – we have sold two big pieces of furniture on craigslist and are collecting things for our spring garage sale. purge purge purge! – we celebrated 6 years by going to a movie with Garner. It was fun and we ate lots of junk food. 🙂 I’d call that special. Many more things to do on the list. I’ll clean out a closet today and find a recipe to cook something I’ve never tried before this week. It will be in the 60s this week in Memphis – a far cry from our overnight 20s this past week. Ahhh – Spring? Are you coming?